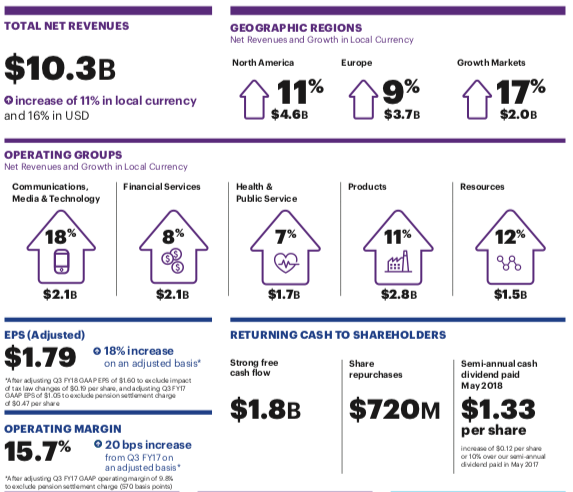 Accenture ($ACN) provides management consulting, technology, and outsourcing services and is normally among the first companies reporting earnings at the beginning of each quarter: I find their earnings more interesting than those of Alcoa which have traditionally been considered as the start of the earnings period. The company reported an earnings beat for Q3 on June 28th for both EPS and revenue. Guidance was reported as being in-line with expectations. Earnings misses are rare for $ACN and the company forecasts more top- and bottom-line growth in the quarters ahead. The company is now up 8% YTD and has beaten the market over the years doubling its value over the last 5 years and tripling its value over the last 10 years. Despite these capital appreciation figures, it also yields a 1.6% dividend to its investors. Accenture is a global leader in the digital transformation and is also seen by some as a #blockchain play. Will the next bear market come as early as in 2019 ? As the impact of federal stimulus fades, so should U.S. stock prices. Is the valuation of the S&P 500 reasonable?